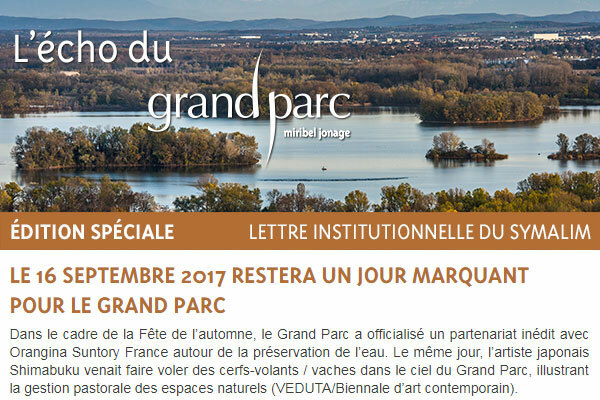 The Grand Parc offers you a new running trip. This activity for everyone can be done alone, in group or with family. This trip takes you on natural and informative territories of the Grand Parc. This stroll can be done running or walking. Plan appropriate equipment: sportswear, trainers. Do not forget to keep hydrated, especially children. Many drinkable water places are available throughout the trip. This is a panoramic trip offering the discovery of the lakes of the Grand Parc. The starting point and the point of arrival are marked by a sign situated in front of L’atol’. Runners could next get their bearings thanks to kilometre markers placed throughout the trip. For the less experienced runners, all the pedestrian paths are appropriated to running: it is possible to define a shorter trip while remaining on marked paths. At the Grand Parc reception, head towards east following the golf course of L’atol’ before arriving in the Fontanil area (Pyracorde play area). Next, you enter into the Grands Vernes area (possible break at the peninsula vantage point on your left). Then you come up to the area of the two lake passage (lake of the Drapeau and lake of the Pêcheurs). Leave the path to run towards the lake of the Droite, then towards the Vorla footbridge. Then you arrive in the Mama area (summer refreshment room). The trip successively goes on the Grands Brotteaux peninsula, the Lézards cove and peninsula to arrive on the Baraka area (beach and summer refreshment room). The loop goes on one of the panoramic viewpoint of the lake of the Eaux Bleues (art work here) before reaching the ford on your left (Morlet area, beach and summer refreshment room). Finally reach your starting point following the driving range of L'atol'.